Tu'whacca is the god who escorts the souls of departed Redguards to the afterlife of the Far Shores. Though a soul may have enemies who will try to keep it from reaching the Far Shores, Tu'Whacca is sly and clever, and always outwits them. 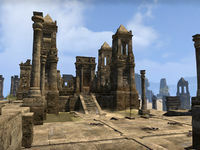 Tu'whacca's Throne is a ruined temple in the central Alik'r Desert, southeast of Sentinel. The Withered Hand have invaded the temple and raised the consecrated dead buried within. Tu'whacca's Throne Objective: Stop Uwafa from raising the dead at Tu'whacca's Throne.